1. What does my child need? Quality running shoes that fit well are important for runners’ feet. You can buy them anywhere, but Tri-State Running Company in Edgewood offers our team members a 20% discount and does a good job of fitting customers with the proper shoes for their particular feet. Runners should bring a water bottle to practices and meets. Parents are encouraged to run with the kids and might benefit from a running watch so they can time some of the runs and practices on their own. It doesn’t take long for your runners be become obsessed with their times! All parents who want to run with the kids at practice need to be Virtus trained. Typically we need at least three parents to run with the group. We like to have a “fast” parent at the beginning of the group, one in the middle, and one at the end. This way adults have all the runners in sight at all times. 2. What if my child can’t make a practice or a meet? 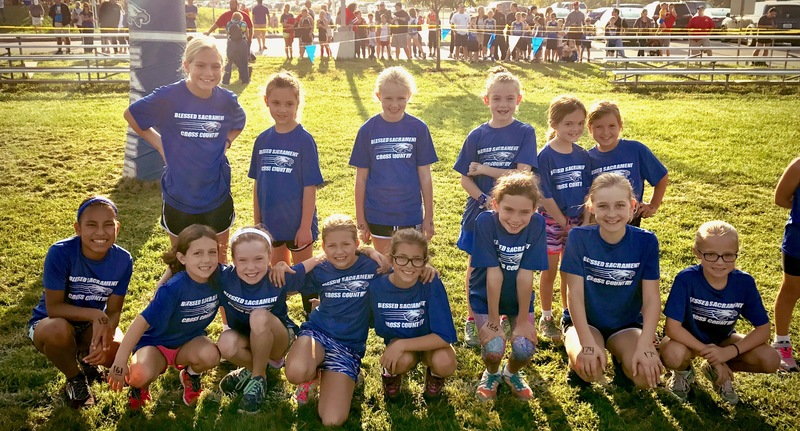 Many of our runners play multiple sports, and scheduling conflicts arise from time to time. Most kids will miss a couple meets throughout a season. Hopefully the kids can make it to most practices, but if they need to miss some we ask that they run on their own during the week. If a runner is unable to attend a meet, the coach needs to be notified in advance. Each meet is entered and paid for separately. Knowing who will and won’t be there helps us plan better and keep costs down. 3. When and where will meets be? The season runs from the middle of July through the first weekend of November. Meets begin in August; most are on Saturdays, and there are usually a few on weekdays after school. Because meets require a lot of acrage, they are typically held in rural areas. Most are within a 30 minute drive, but we do also go to Lexington twice, Maysville once, and Centerville, OH once. Carpooling is common. 4. How far will the kids have to run? The meets are usually 800-4000 meters (0.5 - 2.5 miles), with the longer distances for the older kids. The distances work their way up during the season -- early season races tend to be shorter, and late season races tend to be longer. During practice we work our way up to run a total of about 2 miles for younger runners and 3 miles for older runners, broken up with some games and drills. 5. What do we do if it rains? We get excited because running in a nice, steady rain feels great! If there is lightning, high winds, a high heat index, or other National Weather Service warnings we will cancel practice via a group text to parents through the Remind app. It is rare for meets to be cancelled, but if we’re notified by a meet official of a delay or cancellation we would text as soon as possible via the Remind app.